As Earth Hour 2010 goes truly global, organisers are aiming for a total of 1 billion, yes that is 1 billion participants for this years event. The timing for Earth Hour is Saturday 27th March, 8.30pm- 9.30pm, local time, wherever you are in the world. In my home city Melbourne, there will be a free screening of the film Home at Federation Square, so bring down a picnic and a blanket, and enjoy watching the lights of Melbourne enjoy a night off! Earth hour was started in Australia, so lets lead the way for the biggest (and darkest) Earth Hour yet! Check the Earth Hour website for details of how your local community is getting involved. 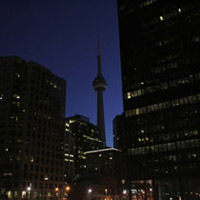 More than 88 countries and 1500 cities took part in Earth Hour in 2009. 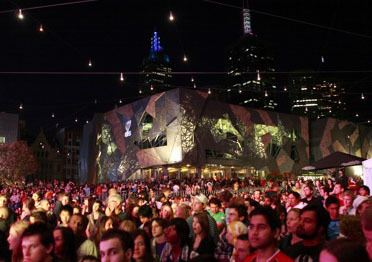 In Melbourne the free concert in Federation Square was powered by people power, pedalling so madly that a whole lot of extra power was created ( roughly 18000 Wh) that was used for surrounding restaurants and lighting at Fed Square. Over 7,000 people attended the event. In 2008 worldwide icons were plunged into darkness during the hours of 8pm and 9pm, in more than 350 cities and townships. Search engine giant Google joined the party blackening its normally white home page and asking visitors to down their lights too. In Australia a 5% reduction in electricity use was measured across the nation, the equivalent of closing down 4 power stations for the timing of the event. Revellers enjoyed Earth Hour concerts, and patrons enjoyed the candlelit ambience in participating restaurants around the globe. "Now we have this image of darkness, and consciousness, going around the world. It is a message of hope and optimism ... we the citizens of the world are prepared to take action and we want to defeat climate change." The challenge now is for people around the world to make every hour Earth Hour.